If you asked Sir Alex Ferguson at Manchester United or Ron Dennis at McLaren if they would rate the importance of good teamwork out of 10, I have no doubt that they would rate it at least an 11! Henry Ford said "Coming together is a beginning; keeping together is progress; working together is success." One of the things we recommend is to think more about team work as an essential skill rather than a soft skill. It is an unrealistic goal to simply throw together a group of individuals and miraculously expect them to become a high performing team, without giving them to tools to become one! "Always treat your employees exactly as you want them to treat your best customers" (Stephen R. Covey). This process can begin with an exploration of self understanding where a diagnostic tool can be used, which also leads onto an understanding of your team as the results are shared. This essential building block gives a solid foundation of understanding of where the different strengths and skills lie within the team. It illuminates the reasons why friction occurs and consequently can be avoided. Once this has been laid, further progress can be made. "Alone we can do so little; together we can do so much" (Helen Keller). 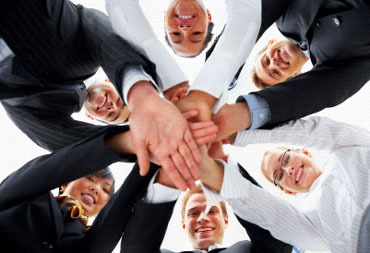 We also like to view Team Work as a language; A collaboration of voices with one mind. We all do things, in work and life, to feel good about ourselves. Sometimes our experiences can cloud this basic need but it isn't irretrievable. Anyone who has children will tell you that even if you have had the worst day at work, if you take your poor mood into a child's life, they will pick up on it immediately. To prevent this distress to your child, we normally choose to change our behaviour to not upset them. Is there any reason why we can't do this with interactions at work? It's always worth remembering how we choose our behaviours, every day, at work or at home. This is also reflected in team work recognition and praise within the workforce. Nothing compares to a few well-chosen, well-timed, genuine words of praise. They're absolutely free and worth a fortune. Ella Wheeler Wilcox supports this theory; "A pat on the back is only few inches from a kick in the arse, but is miles ahead in results." As a Team building company we can provide facilitation and feedback onur team's ability to provide effective cohesion and team work. We firmly believe that a few hours developing communication skills, unity, collaboration and reward will unite any group of people into effective teams working towards a common goal. Talk to us today to see how we can help develop team work within your organisation.